Months ago, Alis joined with her new friend Cahan to fight a dragon beneath the School of Spells and War. Now she fights something altogether different: fame. Worse, her newfound notoriety has resulted in a mission to the far north. As if it weren’t bad enough that it’s so cold, she also finds herself in a tiny village whose residents innately distrust spellcasters of all kinds. Yet they tolerate her because she comes with Cahan – and because something is threatening their children. Can Alis and Cahan save them? THE CINDER WITCH is the is the third story of the The School of Spells & War series. following the adventures of the sorceress Alis and her companion Cahan the warrior. 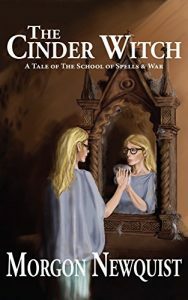 The School of Spells & War Tale Three, THE CINDER WITCH, is 45 pages, DRM free, and $0.99. If you enjoyed Mrs. Newquist‘s DOWN THE DRAGON HOLE, or A MIDSUMMER’S PARTY you will definitely enjoy the third story in The School of Spells & War. The School of Spells & War is an ongoing collection of old fashioned sword-and-sorcery adventure stories following a wizard and warrior duo as they galavant across the continent of Thillon. Good-humored, powerful warrior Cahan and intelligent, skilled wizard Alis work together to serve their university, the school of spells and war, by battling dragons, investigating plots against the king, hunting witches, and dealing with the ongoing threat of the ancient and mysterious Formless. As an added bonus, the first tale of The School of Spells & War, DOWN THE DRAGON HOLE will be free on Amazon from tomorrow, December 30th, 2016, through New Year’s Day 2017 for those who have not yet begun this delightful series.